MANILA, Philippines. This is not your typical convention. 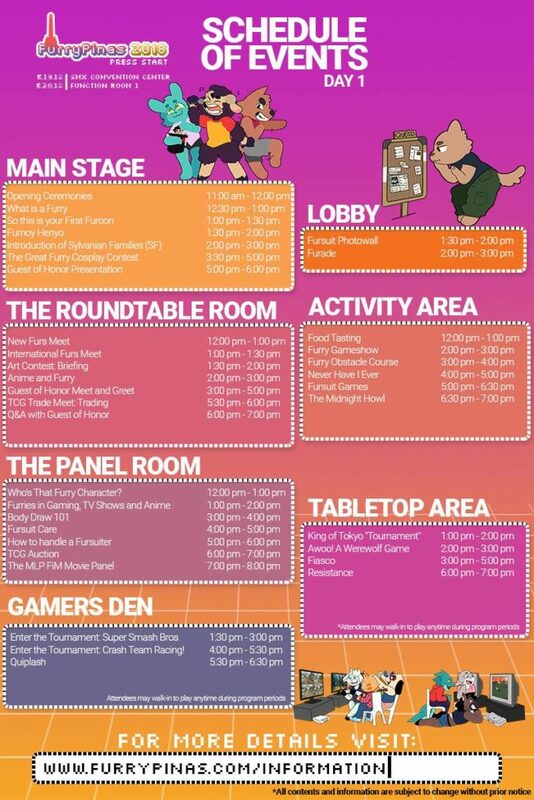 FurryPinas 2018 is something that is unique and something that you should make sure that you attend. 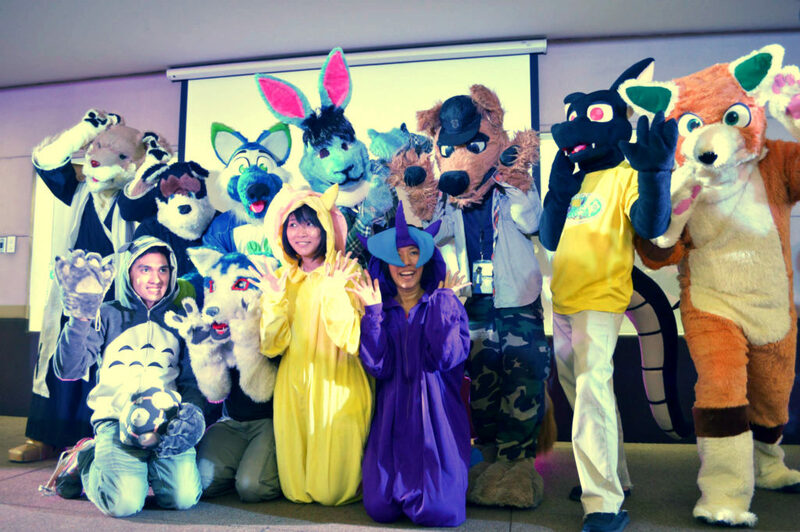 The event which is a celebration of everything Furry in fandom, hobby and pop culture is happening on May 19-20 at the MSX Convention Center in Mall of Asia, Pasay City. We would like to give you a brief FurryPinas 2018 walkthrough so that you will know what to expect. Remember that this event is the first in Southeast Asia and the biggest in the Philippines. What to expect at FurryPinas 2018? Ever wonder what a Furry is and what is a Furry Hobby? Furry, in brief, are any animal characters which have been given a human-like personality. It is not a dog show, nor is it a scientific convention but in fact a pop culture convention for the love of furries. Great Furry Cosplay Contest. This is the first time in the Philippines that a cosplay competition is focusing on characters which are anthropomorphic. What’s even unique is that they give additional points to creativity and unique depictions of said characters, like neko-ified or mecha versions. You can come-in as Beerus from Dragonball, Kurama from Naruto or even one of the Teenage Mutant Ninja Turles. Furade. Suit up in your Fursuit and join the first ever Parade of Furries in the Philippines. Get to be with other fursuiters and let others know how fun it is to be one. Great Finds. We have tons of booths to cater to the hobby. These include merchandise booths and even indie booths. If you are looking for hard to find or personalized items then you might just get it here. The Furry Talent Show. If you are into the Furry Hobby and want to showcase your talents and skills then this is the right time. The stage is set and the audience is ready. 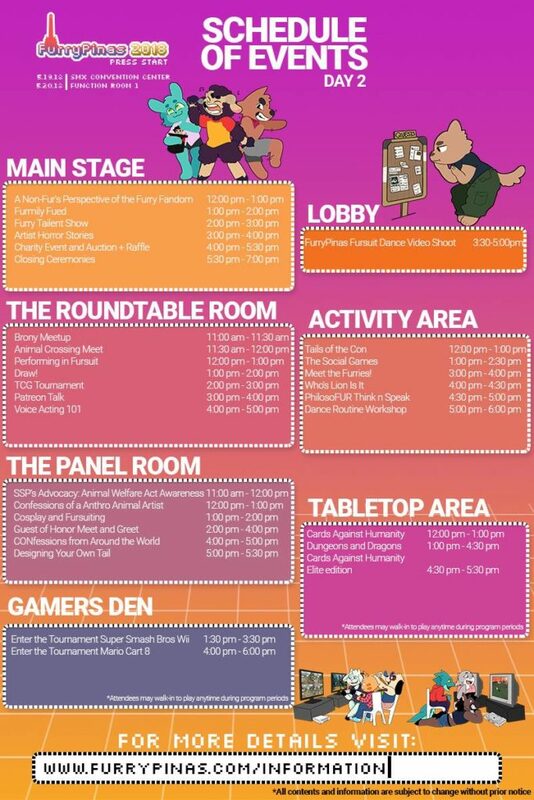 What Areas Can You Visit at FurryPinas 2018? FurryPinas 2018 got so much in store for you, like talks, panels, performances, contests and many, many more waiting for you at the convention. Activities at the 2-day convention will be divided into six areas. All of these areas have different engaging activities in store for you. Join the Furade, where you can join fellow Furries in the first ever parade of its kind or be part of the Fursuit Photo wall in the LOBBY during the opening day of the convention. Watch the various main events and competitions on the MAIN STAGE. For those who want to have more personal engagement with others through various activities and discussions then come visit the ACTIVITY AREA. There will also be a PANEL ROOM where various discussions together with selected guest speakers will happen. You can even join more personal discussions in the ROUNDTABLE ROOM. If you are a gamer then explore either the TABLE TOP AREA for Table Top Games or the GAMER’S DEN where you can relieve retro games and even join the tournament. What are you waiting for? Get your tickets now and be part of this very exclusive and unique event of the year – FurryPinas 2018. For more information please visit www.furrypinas.com or like them on Facebook at www.facebook.com/FurryPinas.